Prestashop Bulk Order Delete : Not able to delete unnecessary, test or any orders from your Prestashop. Bulk order delete can do this job for you. Not only this module will allow you to delete orders in bulk but also you can erase related information like invoice, cart details, delivery slip, payment history from the order. Prestashop Bulk Order Delete - Not able to delete unnecessary, test or any orders from your Prestashop. Bulk order delete can do this job for you. Not only this module will allow you to delete orders in bulk but also you can erase related information like invoice, cart details, delivery slip, payment history from the order. Delete button is provided in the 'orders' section. Very useful for the merchants who want to delete the test orders created for checking the workflow of the website. Admin can delete the multiple orders at a time. Delete related information like cart, invoice, delivery slip, payment history, and messages from an order. 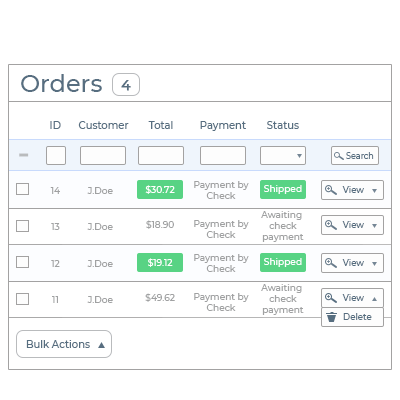 Delete order details or order with a particular order id of a linked order. Specify the status on which orders or order details get deleted. Delete unnecessary orders from your PrestaShop store with a single click. You can erase information related to orders like invoice, cart details, delivery slip, payment history, and order messages thus cleaning your database. Delete all the test orders you have created to check the workflow of your store at once. Cleaning the test orders will lead to improved order management in your store. Did you buy Prestashop Bulk Order Delete ?